How do you celebrate the 30th birthday of video gaming’s most iconic character? You give creative control to the players that made that character an icon. Super Mario Maker turns over the keys to the Mushroom Kingdom to create the most magical Mario ever, even if it’s sometimes marred by very Nintendo-like decisions. As the name implies, Super Mario Maker is more of a game about making than playing. Playing others’ levels is fun, but that’s what we’ve all been doing for three decades now. Getting to create your own vision and unleash it on the world is Mario Maker’s meat and potatoes. You start out with a paltry set of tools: some building blocks, goombas, koopas and a few more environmental elements set against a Super Mario Bros. backdrop. With enough time spent building courses and using the items you’ve unlocked, this set of tools can expand quite rapidly. Every time I saw a delivery truck appear on my screen, I was excited for what would show up. With time you unlock Super Mario Bros. 3, Super Mario World and New Super Mario Bros. U themes for each item, along with a few different types of stages, from the typical 1-1 style level to Bowser’s airships and castles. Mario Maker is the game that finally makes the case for the Wii U gamepad. It’s hard to imagine a better-designed interface for crafting levels. Just dragging an item out of the toolbar across the top of the Gamepad’s touchscreen sets it into the level, from there you can choose to duplicate that item, or even tack other wacky things onto it. Wanna make a winged-super-sized Bowser with a fire-breathing piranha plant sticking out of his head? You can do that. Wanna then throw that monstrosity in his weird clown-face-vehicle-thing? You can do that too. Want the screen to rain confetti while some crazy music plays in the background while you fight your new abomination? Go for it. Every aspect of course creation is designed to surprise and delight. Nintendo’s thoughtful approach to making the art they’ve perfected over the years accessible to those of us without the deft hand of an EAD developer shows in every interaction. Nintendo has delivered in one shot on all of Little Big Planet’s promise; for all that Sony’s game was ambitious in doing, it never produced anything that even approached the polished feeling of an actual game. Mario Maker, on the other hand feels so close to the real deal—even in the hands of amateurs like us—that it’s scary. 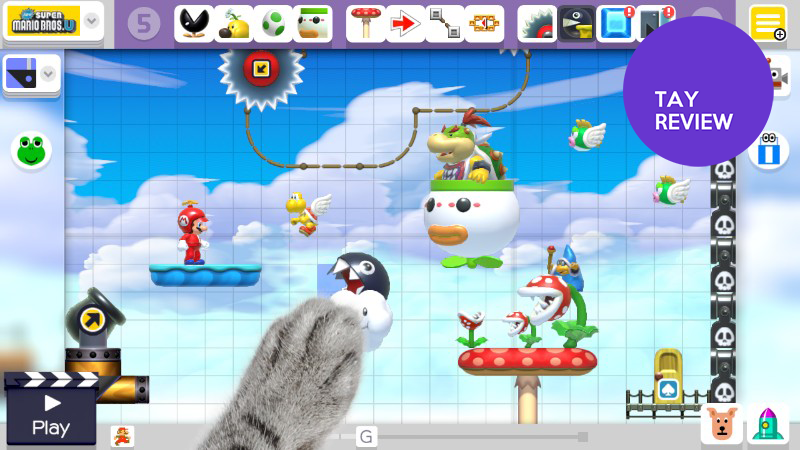 Also, you can have a friggin’ cat hand. That’s awesome. There are games that support amiibo, and then there’s this game. Mario Maker works with darn near every amiibo out there, even the ones I would reasonably expect not to work. Sonic and Mega Man are able to act as costumes for our mustachioed hero, and even come complete with sound effects and victory tunes from their own games. On top of that, most, if not all, of Nintendo’s own characters are accessible via their amiibos. Unfortunately, amiibos only work in SMB1-themed levels, leaving the other three Mario themes out of the fun. It’s cool to see characters get 8-bit demakes, but it would have been really nice to see them supported across the board. That said, no other game supports Nintendo’s figures as thoroughly as Mario Maker, and cramming so many of Nintendo’s classic characters Disney Infinity-style into a game like this really shows the potential of amiibos as a platform. Nintendo’s solution for allowing players to discover new courses and creators is elegant, simple and fun. All you do is choose if you want to play the 10 Mario Challenge, a selection of 8 stages in which Mario gets 10 lives to clear them all, or the 100 Mario Challenge, which is much the same but allows you 100 lives for 16 courses at varying difficulties. If you opt for the 100 Mario Challenge, you get to choose between three difficulty levels: Easy, Normal and Expert. I assume these are determined by each course’s win ratio, as those populating the highest difficulty tend to skew to the absurdly difficult, complicated side of things. Once you’ve completed (or failed) your challenge, you can go back through your play history and follow those creators if you see fit. You also get the opportunity to comment on or star those courses. All the songs in Super Mario Maker are the same songs of the original Mario titles. Overworld, Underground, Underwater, Airship, Ghost House and Castle. All of them return for this game… but wait, Super Mario Bros. never had an Airship or Ghost House theme, right? And as amazing as these new songs are, they cannot hold a candle to what happens in the “Create” mode of the game. What Koji Kondo alongside Asuka Hayazaki and newcomer Naoto Kubo have done with these classic songs is simple, yet mind-blowing. Nintendo has always had a penchant for dynamic soundtracks. Even in the old days of the NES, one of Kondo’s most important task was to compose a track that would accentuate and synchronize with Mario’s action in the first section of World 1 - 1. That recurring gimmick became a staple of the series: whether it’s the goombas dancing to the tune of the New Overworld theme in New Super Mario Bros. or the musical changes in Super Mario Galaxy’s battle against Bowser. Super Mario Maker is no exception to the rule, but in this case the gimmick doesn’t present itself in the levels themselves but in the level editor. Actually, it happens as soon as the game transitions between modes. The theme song for the level changes without a stutter or interrupting the audio of the game. I’ve made this comparison before, and even after hearing these new themes for hours I feel the same way as I did when I first heard the music of Super Mario Bros., and yet it feels different. The way the music behaves in the editor feels like having your favorite plate from your childhood as interpreted by a renowned chef—think of that scene in Ratatouille where Anton Ego eats the Remy’s version of the Ratatouille. This new take on old classics is equal parts nostalgic and new, and it feels wonderful. It’s where the soul of the game resides, and where the connection to an old SNES title shines the most. If you remember Mario Paint, you might recall one of the most memorable aspects of the game was its quirkiness, especially the way it was expressed in tandem with the sound design. Every brush, eraser, stamp and menu uttered cute and funny sound effects. When placing assets in the grid of the editor the game announces the name of that certain asset. But does it in the most bizarre way, instead of just name calling the object, the game modifies the voice to match the pitch and beat of the music playing at the time. Super Mario Maker even managed to cram in a mini music editor. Players can compose songs by strategically placing objects and Special Note Blocks (it looks just like a regular Note Block, but it’s colored pink), and while the editor is not as robust as the one found in the Mario Paint, it won’t take long for people to compose amazing cover of popular songs. Super Mario Maker is pretty much like Mario Paint in that sense. After all, Takashi Tezuka mentioned at various opportunities that the original plan was to create a sequel for Mario Paint. That project died, but many of the ideas remain — one could say that Super Mario Maker is the spiritual sequel to the SNES creative suite. Say what you want, but Miiverse is one of my favorite features of the Wii U. Unfortunately it is criminally underused, much like every other unique feature of the console. Lately Nintendo has managed to merge the social network into some of their games, with the most successful implementation being for the summer blockbuster Splatoon. While the feature in Splatoon was used to give Inkopolis, the main hub of the game, a distinct look and feel, in Super Mario Maker it is used in a more traditional manner. Users can post comments and drawings to express how they feel about any given section of the level. Players can leave tips or in many cases misleading tips, in a way that feels similar to how the Souls games have incorporated the community into the game. And while Mario Maker is in no way similar to the games developed by From Software, this merging of community and gameplay fits like a glove. User content has the potential to affect the way we approach and perceive our games, and whether the impact is big or small, I feel that every game should try to integrate their community in a unique way. Super Mario Maker may be a single player experience, but the Miiverse community makes me feel like I’m cruising through the levels next to thousands of other players. Once you’ve unlocked the full set of course creation elements, you’ll find you have a pretty good palette of enemies, environments, themes and powerups to choose from. You’ll also find a lot of notably absent ones. Sure, you can select mushrooms, feathers, leaves and fire flowers, but where’s the tanooki suit? Where’s the frog suit? Where’s the ice flower or the penguin suit? I’d love to get a p-wing, too. Could you imagine the possibilities of levels if Mario could sustain flight indefinitely? It’d be epic. The omissions extend to enemies both big and small too. Where are NSMBU’s Balloon Goombas and Flipruses? Or how about Boom Boom, the boss from SMB3’s famous airships. Let’s get the angry sun from those desert levels too, please. For as much as Mario Maker includes at the onset—and it is a great starter kit, I’m not saying there isn’t enough to make a fun level, there is—I still feel a sense of missed opportunities . I wouldn’t be surprised if Nintendo expands our options with DLC later on. I mean, that empty row isn’t just there for kicks, is it? The basic idea goes something like this: New Super Mario Maker players are only allowed to post up to 10 levels until the community approves them to post more by starring their courses enough to earn them the right to post more. I didn’t initially think I’d like the idea of limiting users, but it’s kind of nice. As a result, the overall quality of levels seems to be higher than I’d expect from a game that’s based almost solely around user-generated content. Putting the power to make your soapbox bigger in the hands of your audience is a brilliant idea that encourages thoughtful curation of your own content. It’s organically keeps the market free (at least as free as it can be) of nasty, ugly content as well as encouraging players to up their game creation game. Well played, Nintendo. Look closely at levels based on New Super Mario Bros. U and you might notice something seems… off. While Mario moves at 60 frames-per-second, lesser enemies like Goombas and Koopas seem to have been reduced to 30 frames-per-second. They also seem not to be polygonal models, but rather pre-rendered sprites, similar to Donkey Kong Country. Some of the enemies, like Bowser, Bowser Jr. and Kamek are still polygonal models and animate at the same smooth clip as our hero, and as a result are only placeable in limited quantities. As a result, NSMBU-themed levels feel disjointed and limited. They look worse and are the only ones that can’t achieve the same feel as the source material. Oh, Nintendo, you just can’t leave the ghost of your friend code system alone, can you? If you want to share a level you just made with your friends, you have to send each of them a sixteen digit code. Six. Teen. In 2015 there’s no better way to do this Nintendo? I mean, Mario Maker has its own bespoke notification system. Why couldn’t you just select to share, select your friends, and have the level show up in their notifications. I’m not a game or UI designer and I came up with that in about thirty seconds. Yes, I get the codes exist to share with those that aren’t your friends, and that even makes some sense, but why shouldn’t you be able to message these directly to the people you do know? Of course, this is Nintendo and the oddities don’t stop there. You can follow creators, but you don’t get notices when they create new courses, so you just have to manually check in on them. You’d think they’d want you to actively know when someone you really dig made something new for you to play, but Nintendo’s baffling design decisions keep that knowledge from you. You can also create whole worlds, but it’s not easy to share them in their complete, sequential form. Many of these things can—and probably will—be remedied in future updates, but their exclusion from the final release is just strange and frustrating. Super Mario Maker is a game for everyone. The adults who grew up with Mario’s classic adventures will relish the chance to see The Mushroom Kingdom through Miyamoto’s eyes. Children who fell in love with Minecraft will find a way to build worlds in a whole new way. There are some baffling decisions that make sharing and interacting harder than it should be, but regardless of those facts, Mario Maker is a must-own game for every Wii U owner, young or old. Steve Bowling is an aspiring freelance games journalist and critic. When he isn’t designing frustratingly difficult Mario levels, he’s out in the world trying to make it a better place with computers. Follow him on Twitter at @SteveBTAY or read the rest of his articles here. Special thanks to J. ‘Nach’ Acosta for contributing to the music and Miiverse sections of this review. He also deserves thanks for having a glorious mane of hair. Seriously, it’s beautiful. You can see it on Twitter at @Nach212, or you can likely read about it, as well as food and other musings here.